President Muhammadu Buhari on Friday said the Federal Government is ready to offer amnesty to members of the Boko Haram sect that are willing to drop their arms. President Buhari said this at a meeting with the schoolgirls who recently regained freedom after they were abducted from their school in Dapchi, Yobe State by Boko Haram terrorists. “Federal Government is ready to rehabilitate Boko Haram militants who are ready to lay down their arms,” he said. 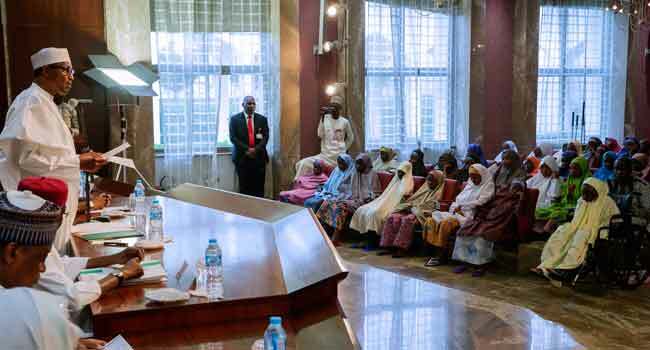 The President who met with the schoolgirls two days after they were released by the terrorists promised that efforts are ongoing to ensure the release of every Nigerian citizen that is in terrorists’ captive. “While further efforts are being made to secure the release of every abducted citizen in Nigeria, Government is ever ready to accept the unconditional laying down of arms by any member of the Boko Haram group, who show strong commitment in that regard. “We are ready to rehabilitate and integrate such repentant members into the larger society,” he said. Buhari also warned security chiefs over any lapse and directed security beef up in schools that are vulnerable to attacks. He said further that the negotiation strategy with the terrorists was effective as it aided release of the abducted schoolgirls unhurt. Special Adviser Assistant to President Muhammadu Buhari on New Media, Bashir Ahmad using his official Twitter handle @BashirAhmaad shared a video of the Dapchi schoolgirls at the presidential villa and quoted Buhari to have said the negotiation paid off. “We entered into negotiations solely to make sure that no single girl was hurt. This strategy paid off as the girls have been released without any incidents,” he said. The Federal Government has confirmed that the release of 106 Dapchi schoolgirls abducted by Boko Haram terrorists on February 19 in Yobe State, was unconditional and no ransom paid. Minister of Information and Culture, Mr Lai Mohammed, confirmed the number on Wednesday saying a total of 106 abducted persons, comprising 104 Daphi schoolgirls, one other girl and a boy were freed by insurgents in the early hours of Wednesday. Briefing journalists in Maiduguri, Lai Mohammed, said all the 106 persons were freed unconditionally and that no ransom was paid to secure their release.